There it is, have a look, the cutest bus in Tokyo. 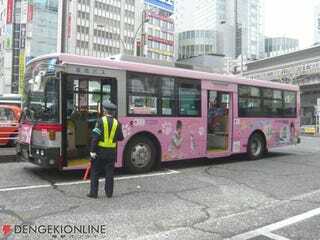 To promote DS game Kawaii Koneko ("Cute Kitten"), the above bus was wrapped in cavity inducing sacchrine. The pet sim went on sale way back in January and lets players pick from eight different breeds like Russian Blue and American Shorthair. The bus ad features cutesy Japanese celebrity person Becky. See that old dude flagging down that pink bus? His teeth hurt. Pic of Becky, a cat and part of a wheel after the jump.